Chiminea accessories, covers, replacement fire grates, grills, pie irons, Jaffle irons and waffle irons. 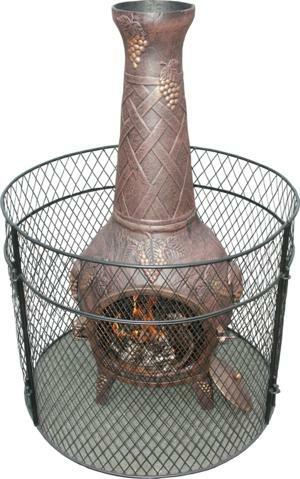 Our Deluxe Medium cover is suitable for our chimineas up to 90cms tall including the Phoenix, Vienna, Grapevine. Alacante, and Small Palma chimineas. Water resistant polyester fitted chiminea cover with elasticated bottom. UV stabilized. Our Deluxe Large cover is suitable for our chimineas from 42" - 56" tall, these being the 43" Basketweave, Large Valiant chiminea, Algarve, Large Palma, Calico. Water resistant woven polyester fitted chiminea cover with elasticated bottom for simple securing. UV stabilized. Colour Black. 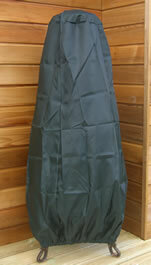 Large Deluxe cover £11.95 when ordered with a chiminea. 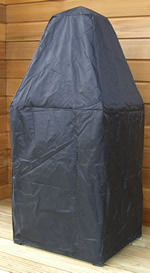 Our Deluxe Xtra Large cover is suitable for our chiminea's from 53" tall, these being the Sienna. The Classic Urn, the Tampico, the Pasadena, the Alfresco and the 53" Basket weave chimnea. 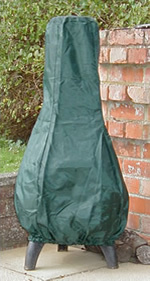 Hardwearing, Black waterproof woven polyester fitted chiminea cover with elasticated fastening for simple securing. UV stabilized. 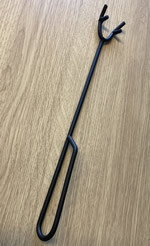 This item is supplied in a green colour material. Status: In Stock UK Delivery 1-3 days Please note, we will add £4.95 P&P for covers if ordered separately. 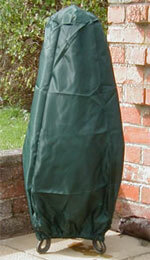 Xtra Large Deluxe cover £14.95 when ordered with a chiminea. Our Deluxe XL Pizza Oven cover is tailored to fit only this chiminea. Hardwearing, 100% waterproof woven black polyester fitted chiminea cover with drawcord fasteningfastening for simple securing. UV stabilized. Deluxe Pizza Oven Cover £16.95 when ordered with a chiminea. We generally recommend that you treat a hot chiminea as you would a hot barbecue, using the common sense associated with such a product. For safety and peace of mind when little ones may be around, we would highly recommend our safety guard. Made from 3 sturdy equal sides, it simply locks together forming a barrier.